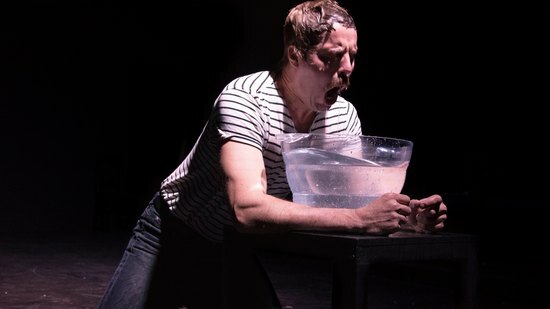 A Beast/A Burden gives you a glimpse in the crazy and unorthodox artist Chris Burden from the opening scene when he’s attempting at breathing oxygen while submerging his head into a bowl of water to getting shot to having the audience write on his body. Now I want to know more about the artist and the reasons behind his obsession with doing the weirdest stunts to cause a reaction to the spectators. The one word that popped in my head as I grabbed that sharpee to write on the bare artist was “free” and I’m still wondering why. Some scenes were blocked from my view since I sat on the first row and two actors stood in front of me. Maybe stand where no audience’s view will be blocked. What is art? That’s the question that Chris Burden (played by an engaging and powerhouse Ben Hethcoat) asks the audience after having witnessed some of his stunts or pieces that makes you question: is this art?